sorry we are late, but Like we said on our Twitter and Facebook, we had a company meeting which ran really late and decided to postpone to today. This week lots and lots of things ended up happening. Two more books are finished being written and set to undergo the editing phase in the next couple weeks. We finished lots and lots of vector line art as well (still have tons to go), finished colour tuning more of the posters for Ciderfest as well as got all our ducks in a row and for our vendors table at Ciderfest. Lots and Lots of merch! All in all that is really the long and short of this past week. See you next weekend! And be sure to check out our Facebook, Twitter and Patreon, word on the street is that we might be doing something cool with them. This week had us getting back into the usual Grind. Livestreaming everyday and vectoring away all the items. We’ve also been doing lots of writing, getting our Bestiary, Martial Arts guide and Game master’s guide prepped and ready to start formatting. Other than that things have been pretty quiet. we’ve just been focusing on getting as much as we can done to display at Ponyville Ciderfest. So all aboard the hype train! Hey Dead Tree Fans! Sorry we haven’t been doing a whole lot of livestreaming this week. L9OBL pulled a 30hr livestream-athon on some about 5 pots of coffee and completely burned himself out, so he’s been colour tuning all out Poster Prints in anticipation for Ponyville Ciderfest as a way to unwind. Our other artists have been hard at work doing Vector art but they don’t really livestream that much. So yeah, that’s pretty much what happened, lots of different art and stuff. Also, we are aware we haven’t updated the WIP and sneak peak folders this month, We just haven’t gotten around to it yet being a little over worked, don’t worry it’ll get updated soon. Also don’t forget to leave a comment, visit our Facebook, Twitter and Patreaon! It would mean a lot to us. That’s rights Dead Tree Fans! This weeks we have a Pretty big site update. For those who have been following us for longer can note. We did to not support any comments on our blogs. However we have spent the last few weeks fiddling with Disqus and word press so you are now capable of leaving comments on our posts, and even browsing our older, more archived posts. To leave a comment all you need to do is either click on the Title of the blog or click the “Leave a comment” link at the top of each post and it will bring you to our revamped WordPress site which has, until now, been acting behind the scenes as our blogging tool. we are interested in reading all your questions, comments, queries and insults! Other than that, we have also got a lot of art done as well as some boring business stuff I can’t really talk about. 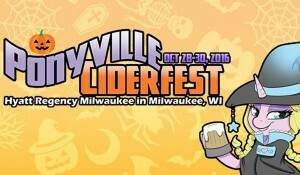 But for those going to Ponyville Ciderfest in Milwaukee Wisconsin on on the 28th – the 30th of October, you’ll be happy to know that we will be having a Vendors table in Artist’s Alley! So come say hi, and check out some of the Merch we will be selling. That’s Right! Merchandising! Merchandising! Dead Tree the Posters, Dead Tree the Badges, Dead Tree the T-shirt, Dead Tree the Colouring book, Dead Tree the Lunchbox, Dead Tree the Breakfast Cereal, Dead Tree the Flame Thrower! (The kids love it), Last but not least Dead Tree the Mini Figs. As usual lots of art got done, AND we also had a bunch of minor site updates. Which you may or may not notice around the site. There were a couple Major site updates we were hoping to get done for today but unfortunately they took a little too long. So hopefully they will be done next week’s Blog Post. Till Next time Dead Tree Fans! 2/3? Let’s go for best 3/5! Heyo Dead Tree Fans! And welcome all the new fans we got over the last week from BronyCon! Towels are to your left, Poisoned Kool-aid to your right. Please keep your hands and feet inside the ride at all times. Don’t ask to get off as the ride never ends! For those of you who were not at BronyCon I did indeed manage to escape the office. I wish to thank everyone who sent in coffee during my terrible tribulations. I Love you all. As for what happened this week. We had a meeting and discussed many things. Mostly boring things like due dates and expenses. and some fun Things like what we plan on doing at some of the cons we’ve applied to. Can’t say much yet, but as soon as we get our official acceptance and or Denial letters, we’ll let you know where we’ll be and what we’ll be doing. that’s right DTS Fans, I have a new clock! so hopefully I will stop posting late blog posts! Though this one will be a little short, This week, we’ve been Vectoring our items for the books, and hanging out at Bronycon, Yours truly spent the weekend locked in his office with a bowl of dogfood however… Other than that, not much has happened that really hasn’t been mentioned. So with that I’m going to get back to figuring out how to escape this office. Locked in the Office, Send Help! So most of DTS Is at BronyCon this weekend, and the Bastards locked me in my office. I was going to post about this earlier today, but they cut the router to my computer, I had to hack the Stream’s feed to get this Measly S.O.S. out on our website! They left me with a pot of coffee and a bowl of dog food and I’m ALMOST out of coffee. so send coffee, and come hang out on picarto: HERE if you’re not at BronyCon. If you are infact at bronycon, look for a giant Viking of a Man slinging crits in the back alley. tell him I need more coffee! There’s also Our editor in chief, and Lead Game Dev as well so keep in eye out for a Pilot in a Stetson and a man with Hair taller then he is short! Yeah yeah yeah, I’m Late again, I know. Unfortunately I spent the weekend learning the ins and outs of Adobe Illustrator. Why? Well because we have moved on to the second portion of our “12 step art guide to successfully taking over the universe!” I mean of doing all the art in our books. Other than that, not too much happened last week, just art really. And Then I said, Linear Timelines, are you Crazy!? Yeah I know we’re late with this week’s update. I have a long weekend off from my day job and it kinda messed with my perception of time. So here we are on MY Sunday. Can’t say too much else has happened. Just more art, writing and editing really. Also, while we won’t have anything official, a couple of our members are going to bronycon to hang out and hand out business cards. So keep an eye out for a group of shady characters slinging epic adventures in the back alley…. I mean Games room.